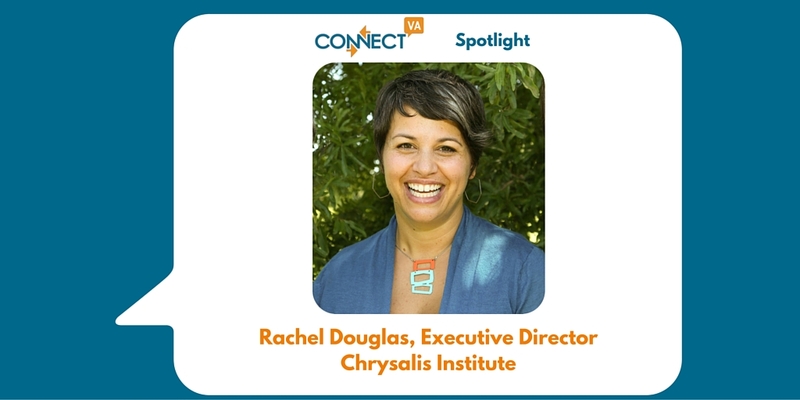 My name is Rachel Douglas and I’m the Executive Director of Chrysalis Institute. I have degrees in Marketing (AAS), Women’s Studies (BIS), and Social Work (MSW). I worked at VCU for 15 years serving the nonprofit sector, through the Division of Community Engagement, before I moved professionally into the nonprofit sector. I also had the unique privilege of being housed at the Partnership for Nonprofit Excellence for 4 of those years and loved building that organization and working with the nonprofit sector from this macro perspective. I care deeply about my community from the margins to the center. I’ve been the Executive Director of Chrysalis Institute for one year. It’s been a transformational year, both personally and professionally. In 2013, Chrysalis Institute announced a new mission of encouraging spiritual growth beyond the conventional boundaries of any one faith. It serves as a resource center for exploring insights and practices from the world’s spiritual traditions, philosophies, and contemporary science. We do this work because, from our perspective, each of us has a unique spiritual identity that can be found through the exploration of age-old questions in shared community and deep introspection. Awakening to that identity brings meaning to our individual human experience and connects us to all of life. Three things distinguish Chrysalis in the Richmond community. Chrysalis does not espouse any belief system; it encourages everyone to find their own spiritual path. Second, it explores the connection between science and spirituality, from Jungian psychology to brain research to quantum physics. Finally, Chrysalis appeals to all spiritual seekers, being open to all faiths or none. Last year, Chrysalis brought Rabbi Rami Shapiro, author of “Perennial Wisdom for the Spiritually Independent” to Richmond. Shapiro spoke about the rising number of Americans searching for wisdom and meaning from a variety of sources outside of or in addition to a particular religion. In a time where polls show that 20-30% of Americans are unaffiliated with organized religion and we are witnessing a growing sense of hatred and intolerance for people who don’t share one’s beliefs, organizations like Chrysalis are needed more than ever. I said earlier that this has been a transformational year for me. I don’t say that lightly. When I came to Chrysalis, the strengths that I brought to the organization were nonprofit management and leadership skills. I did not think I was a spiritual person and I did not have a spiritual practice. Or so I thought. What I have learned over the past year is that spirituality does not equate to religion. And even though I personally don’t find religion appealing, I have been a very spiritual person my whole life. The research says that I am not alone in this view. In fact, a whopping 33% of people identify as spiritual, but not religious. This speaks to the value that Chrysalis Institute brings to our community. It is an oasis of intellectual and spiritual candy for people who are on their own journey. At Chrysalis programs, we won’t try to replace one dogma with another – instead, we hope to expose you to things you have never been exposed to and to inspire you to have your own personal spiritual identity and expression. Another major challenge is that our fundraising comes primarily from individuals. One of my goals is to sustain and grow those individual donors while diversifying our fund development plan to include special events, sponsorship, and grants. The 2016 theme explores the relationship between food and spirituality. Programs will include a Gongfu Tea Ceremony and a workshop on Eating as a Spiritual Practice. On May 20, 2016, keynote speaker Kristen Kimball will share how she left a New York writing career to run a sustainable organic farm providing food to about 200 member families each week. When I look at my own garden and what it takes just to make one side dish, I can’t even fathom farming for every meal for a week for 1,000 people. Chrysalis also offers regular opportunities to explore a variety of spiritual practices. We offer weekly classes in meditation, journaling, singing, drumming, Nia, and yoga. We are expanding practice groups in 2016 because we see how transformation happens through regular practice. ConnectVA helps me keep my finger on the pulse of what is happening in the nonprofit sector. I read my ConnectVA email every day. My usage changes based on what I need. I’ve used the Job Finder, Community Calendar, and the list of webinars and other nonprofit resources. These days I mostly go to the Item Exchange looking for items that are no longer useful to others but would be useful to Chrysalis! The folks that are on ConnectVA are largely the care-givers, the do-ers, the ones with their feet on the ground doing the work that makes this region thrive. You do so much for others, how about doing something for yourself? Doing something for yourself is not wrong or selfish. It does not deserve the guilty feelings we often associate with it. It will help you do the good work that you do, even better. Chrysalis offers the tools for self-care, self-compassion, and connection. Hope to see you soon!! Know someone who should be featured as a ConnectVA Spotlight? Email us at info@connectva.org and nominate someone!